We need a little help. Okay...a lot of help. My sweet, innocent (yea, right), cute, cuddly, first-born will not stay in his bed. Apparently he always hears funder. And he's scared of funder in case you didn't know. 1) Bringing him back to his bed. Again. And again. And again. 2) Reasoning and explaining why he needs to go to sleep. 3) Screaming and spanking (okay, that's an exaggeration). 4) New comforter/sheets (CARS, of course.) Apparently this helps the kid feel more "comfortable" in his surroundings. 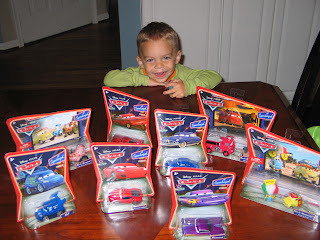 5) We even splurged on the Lightning McQueen lamp!! 6) We bought him a tv/dvd player for his room. 7) We took the advice of DOCTOR PHIL and bought the "sure-thing" "fail-proof" Nighty-Night video - which I even had express shipped, I was so excited at the prospect of a full night of sleep. (For those of you who haven't heard of this - it's a video of animals playing. As the time goes on, the music gets slower, the screen gets darker, and eventually the animals are asleep. The there is a sky/stars on the screen.) Righhhht. We've even sunk to this level: BRIBERY. As I'm writing this, he has sneaked into mommy and daddy's room and climbed into bed and under the covers. Quietly, of course (as if I won't know.) As soon as he falls asleep, I'll gently lift him up and take him to his room. But in a few hours.....he'll be right back. The worst part about it....is Sam and I are the ones who are up all night. The kid just doesn't sleep vertically. Either his elbow is in Sam's face, or his foot is in my back....we're the ones who are up all night moving around HIM. At 9:00 in the morning, when I'm working ... I see him STILL lying there, this sweet angelic smile on his sleeping face and I want to ... wake him up! Please someone.....can you give me a suggestion? Everyone tells me, just keep putting him back in his bed. My neighbor tells me it may take months (gasp!) I can't relive newbornism ....I have done my share of up-every-two-hours! This is not fair and I didn't sign up for it! I love how NO Mommy friends will ever tell you that this happens. That your adorable little 2-year old turns into a maniac. Not until you're going through it and then they all let out the truth..... "oh yeah, well, I'd been meaning to tell you"! Thanks for the heads up, friends! :) I am telling all you moms-to-be out there...BE PREPARED! Well I just thought I'd let everyone in on our pain. Sam's actually been in North Carolina all week - so he's been sleeping good. (Just kidding, honey....I know you're not sleeping well because you can't sleep without me.) <-- Smile! I'm the one who's actually been sleeping pretty good- without Sam in the bed, Zach can pretty much lay horizontally, and there is still room for me. PS: We even tried telling him he could sleep in our room but on the floor. So the first night, I laid down on the floor with him, to get him comfortable. We brought his comforter in. Took the pillows off mommy and daddy's bed, just so he would feel like he was right there with us. Two hours later I woke up, and I'm still on the floor, and he's in the bed. Yeah, that one didn't work so well. Well, everyone, this is my first official BLOG. I hope you find this a fun way for us to keep in touch with you and let you know what is going on with the kids. I thought for my first official entry, I'd introduce you all to a little lady who I like to refer to as Charlotte. Yes, as in Web. This apparently is a run of the mill "garden spider" that made it's home on our front porch. 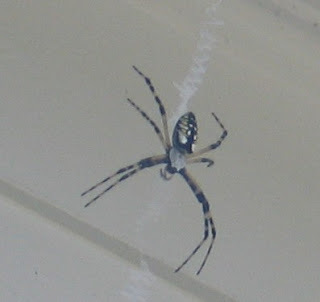 Garden spiders are not poisionous - but they do have fangs and if you get bitten (which I've read is rare) they suggest getting medical attention. (Ya think?!) She lived there for about 2 weeks and spun these enormous, beautiful (if a web can be considered beautiful) webs. We had a storm the other night and it must have knocked her down so she built a new home near our garage. Sam thought she was too close to getting inside, and at a level that the babies could reach, so he .... disposed of her. With a broom. (Meanie!!!) The zig zag down the middle is apparently a way for her to strengthen her web as well as give birds and other animals a visual that it's there (so they don't get tangled and mess up her work!) I was oddly facinated by this spider. (Probably because it moved slow, and just stayed put!) Let me also add: This spider may look small in this picture, but was at least 6 inches long. This is our first official experience with Virginia wildlife - oh, except for Sam running into a bear cub on a hike through the dismal swamp the other day ---- he quicky retreated and went the other way with the thought that Momma was somewhere near. I'll update this BLOG periodically, so if you want to sign up for it, you're welcome to do so. Please post comments - we'd love to hear from everyone!